The imageCLASS D320 is a professional solution for the small or corporate office. It combines a digital copier and a laser printer in one flatbed design. Copy with ease at 14 cpm. 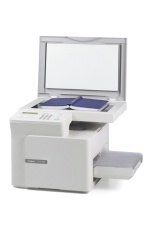 It has many convenient features such as electronic collating, 2-on-1 copying and 50% to 200% reduction/enlargement. Professional laser print resolution of 600 x 600 dpi at up to 14 ppm*. Standard with 250-sheet paper cassette, 10-sheet multi-stack bypass and all-in-one toner cartridge. - 14 copies per minute (cpm). - Canon's exclusive RAPID Fusing System for no warm-up time. - Reduction/enlargement ranges of 50% to 200%. - Special functions such as Electronic collating, 2-on-1 and reserve copy. - Three copy modes: Text, Photo, Text/Photo for crisp quality output. - Make up to 99 copies at a time. - Save toner usage by around 20% using the Toner Saver mode. - Up to 14 pages per minute (ppm). (Print speeds vary with the content of the document and the speed of the host computer). - 600 x 600 dpi laser print resolution (enhanced to 2400 x 600 dpi by smoothing technology). - Optional network printing using the C-6200U. - Flatbed design means easy copying of books, photos and even 3-D objects. - 250-sheet paper cassette plus 10-sheet multi stack by pass tray. - No maintenance, easy to replace, all-in-one cartridge. All data based on Canon's Standard Test Method. Subject to change without notice.